Several prior Russian attempt to reach Mars, including Mars 96 pictured here, failed soon after launch. Out of 21 Soviet, and later Russian, attempts to get to the Red Planet, 18 were unsuccesful. (Credits: Aerospaceguide.net). It was supposed to be a great Russian triumph, possibly the most challenging unmanned mission to Mars ever and a revival of Russia’s attempts to reach the Red Planet. But all expectations turned bitter shortly after the November 8 launch, when the Phobos-Grunt’s booster failed to fire. Now there are increasing fears that the 15-ton Phobos-Grunt probe carrying 7 tons of highly toxic hydrazine fuel will enter the Earth’s atmosphere in a yet unknown location, spilling the toxic substance into the atmosphere. Access to the Red Planet has proven elusive for Russian spacecraft. Russian Mars 96 crashed in the South American Andes Mountains after an engine failure. 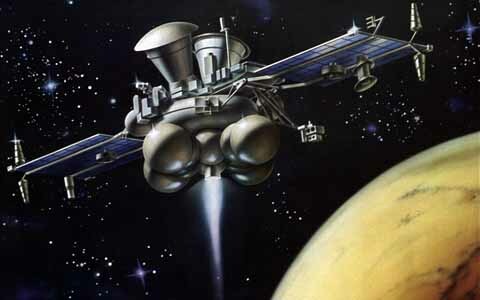 One of two 1988 Phobos probes was lost due to an operator’s mistake a few months after launch and contact with its twin ceased as it reached Mars orbit. The probe currently trapped in Earth orbit was designed by the same company responsible all three failures. Starting in1960 as the former USSR, the Russians tried to send 21 spacecraft to Mars, 18 of which failed. Failure of the Progress Cargo Carrier during launch in mid- August caused a two month delay in Soyuz launches. (Credits: NASA). The current Phobos-Grunt malfunction brings the Russian space program under international scrutiny. It is the fifth major incident in one year under Roscosmos’ direction. In December 2010 a Photon-M rocket failed to launch on its mission to place three GLONASS navigation satellites into orbit. The GPS constellation was quick to fill the gap in Pacific Ocean coverage, making a 1.52 million dollar hole in the Russian budget. Only two months later a Russian military satellite failed to reach orbit, resulting in the resignation of Roscosmos chief Anatoly Perminov. Perminov was replaced by Vladimir Popovik. But the unhappy series continued in mid-August when another satellite disappeared from Russian radar immediately after its launch. Just a few days later, the Progress space carrier, toting 2.6 tons of oxygen fuel, water, and food to be delivered to the International Space Station, broke up into pieces over the Altai Mountains only five minutes into its flight. A faulty gas generator was determined to be the cause of the Progress failure, leading to a re-examination of all Soyuz rocket launchers. The extended review period was the reason for a two month delay of the next manned Soyuz launch, now rescheduled for November 13. In the coming days, Russian engineers will try to re-establish communication with the probe trapped in the Earth’s orbit. If unsuccessful, the Phobos-Grunt spacecraft, by some experts referred to as “the most toxic falling satellite ever,” will probably enter the atmosphere uncontrollably sometime in December. The video below, developed by Roscosmos, details the intended mission of the Phobos-Grunt probe now trapped in Earth orbit.